In 2015, Profilator GmbH & Co. KG introduced the concept of “Hard Scudding®” to the market and began to run exhaustive testing on this game-changing gearmaking process. Global companies are now updating their current processes, part designs and bills of processes to include “Hard Scudding®” in their gear manufacturing facilities. At this point, “Hard Scudding®” is recognized as an accepted process that will substantially increase the overall quality level of gears and splines in the hardened condition. As a reminder, in order to have an optimum “Hard Scudding®” process, the parts need to be heat-treated via carburization or through-hardened. 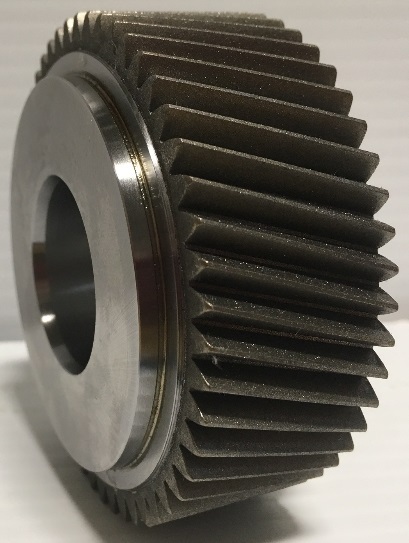 This is due to the fact that the “Hard Scudding®” process requires a minimum of 60 µm/flank stock removal to guarantee clean-up (no blank material remaining) and insure that case hardened material is left on the surface of the gear tooth. At IMTS 2018 in Chicago, we introduced the next revolutionary step in “Scudding” Technology. This new technology, patent-pending since May 2018 by Profilator, is called “Micro-Finishing” via Scudding. “Micro-Finishing” takes place after the “Hard Scudding®” process has been completed. The process will take an already high quality “Hard Scudded®” part and make it better in terms of surface finish. While the overall AGMA, JIS or DIN quality may not change, the surface roughness of the gear teeth will be dramatically improved. It should also be noted that superfinishing gear processes such as this have been shown to reduce friction, increase pitting resistance and increase the life of gears. Additionally, this technology from Profilator GmbH & Co. KG. is a completely “DRY” machining process and requires no cutting fluids or MQL technology. Historically, the results have shown that the “Hard Scudded®” parts are in the DIN 5-6 quality range overall. As you see in a typical inspection chart of a “Hard-Scudded®” ring gear. The lead is very good showing DIN quality of 3-5 while the profile (determined by the cutter) is within the DIN 6-7 range. The characteristics of run-out and index are also in better than acceptable ranges. As a review, the “Hard Scudding®” time for a standard automotive ring gear (approx. 125-140 mm Internal Diameter) is 37-52 seconds (25-40 seconds cutting/12 seconds load-unload-stock division time). In our testing, we are seeing that the “Micro-finishing” process takes approximately 20 seconds on a standard automotive size ring gear. That being said, we estimate that the total cycle time for finishing a ring gear via “Hard-Scudding®” and “Micro-Finishing” would be approximately 64 seconds, if completed sequentially. As we continue to test and develop the “Micro-Finishing” process, we feel that the time estimate noted above could be optimized to decrease the “Hard-Scudding®” and “Micro-Finishing” cycle by 10%, thus keeping the total cycle time under ONE minute for all automotive ring gears. As we have witnessed, the market is turning toward hybrid and e-Drive technology at a rapid pace. In these applications, noise (or lack of noise) is a very important consideration. The gears in these transmissions rotate at extremely high velocities and that increases the possibility of gear noises being perceptible to the human ear. As previously stated, the “Micro-Finishing” technology addresses noise sensitive applications and is aimed at making a quieter gear. The gear may also be a slightly higher overall quality but the goal is to increase the quality of the surface roughness of the gear tooth flanks. Please see Figure 3 as an example of a surface roughness measurement taken on a “Hard Scudded®” only gear and Figure 4 as an example of the surface roughness of a “Hard Scudding®” and “Micro-Finished” gear. In this article, we will highlight Rz as the main surface roughness measurement (you can also see the equivalent Ra and Rms measurements). We selected Rz, as it is the most common surface roughness measurement used in the industry and it displays the average value between the peaks and the valleys of the roughness of a surface. The surface finish of the “Micro-Finished” parts is quite remarkable, as you can see in Figure 4. The observed Rz measurements do not exceed 0.8 µm in either lead or profile direction. This is an incredible result, as it is in line with much more expensive abrasive gear finishing processes which require expensive machining fluids and filtration systems. So, in short, gear makers can achieve this high quality using a “DRY PROCESS” from Profilator GmbH & Co. KG. The “Micro-Finishing” process utilizes a high quality diamond plated tool. This tool concept was designed and developed by Profilator GmbH & Co., located in Wuppertal, Germany. 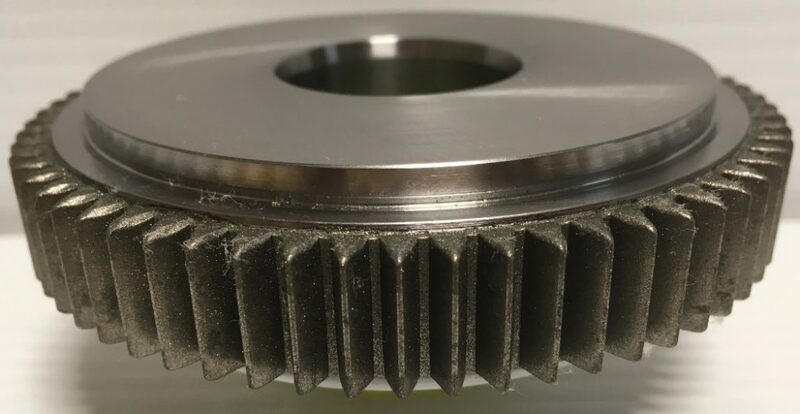 This unique process is designed to remove only a small amount of part material where the resulting part provides the user a great benefit, in terms of surface quality on the gear teeth as well as noise reduction. This fine finishing process is completed using the high quality industrial diamond tool, noted above, with an average particle size of 45 µm. 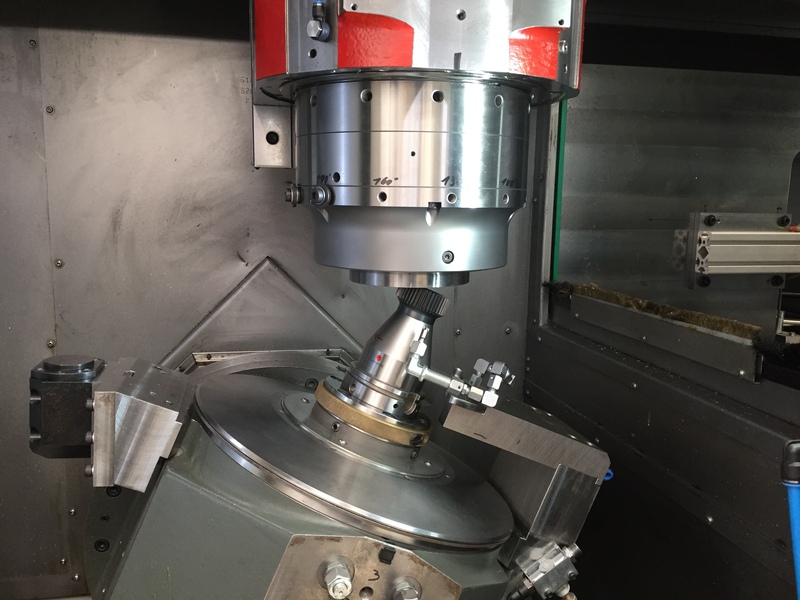 During the process, the tool will remove approximately 20 µm of stock per flank which will not largely alter the gear geometry but drastically improve the surface finish on the gear teeth. Due to the relatively small amount of stock removal, it is believed that the tool life will be very good. Testing continues to confirm this fact. The “Micro-Finishing” technology can be applied in several ways on Profilator equipment. It can be a “stand-alone” process on a Scudding® machine, it can be a sequential process where “Hard-Scudding®” and “Micro-Finishing” are completed utilizing a tandem tool set-up or it can be applied on a double spindle Profilator Scudding® machine, where the processes of the “Hard-Scudding®” and “Micro-Finishing” can be completed simultaneously. In many cases, the part geometry will define the optimal process for the user. It appears that the future of the Scudding® Process remain very bright and on the “Cutting Edge” of gear technology. Whether you are looking to process your parts in the green or finish hardened condition, Scudding® is today a viable process for your gear company. Resolving Oven Heating Issues: Repair, Replace or Reinforce?